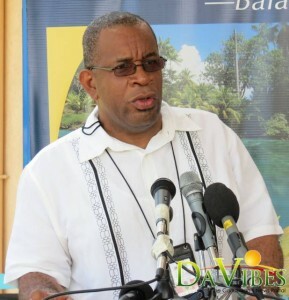 The importance of declaring whether you are travelling with large sums of cash to the immigration officer has been highlighted by the chief executive officer of the Dominica Air and Sea Ports Authority, Benoit Bardouille. Persons who are traveling with over ten thousand dollars cash must declare it on their immigration forms in keeping with the airport and international regulations. Bardouille explained this must be done before it is found during a search of the luggage. If one does not declare that they are traveling with in excess of ten thousand dollars, the relevant agencies need to be notified. DASPA, he said, on last week’s DASPA in Touch, is aware that some persons, based on the business they conduct, will need to travel with large sums of cash. This is what they would like to educate the traveler about adding that DASPA is not seeking to inconvenience travelers but rather ensuring that it complies with international laws which it is a signatory to. Moreover Bardouille said DASPA works with other law enforcement agencies providing them with pertinent information. Traveling with more than $10,000? Declare it, DASPA . to USA. This FATCA regulations are very repressive to the Caribbean. I wanted to invest in a company in Dominica but I changed my mind due to the onerous requirements on the application form. I had to get a Justice of the Peace to sign, photos of myself, copy of my passport, etc. Way too restrictive. Just another American scam to continue oppressing people. Soon they will include debit and credit cards. International best practice Mr. Bardouille is USD$10,000 and not EC $10,000. Get your facts before you speak. FATF standards and recommendations does not refer to EC$10k. The Man never said it was EC dollars. Given he was not clear about the currency, but after reading his explanation what would happen if you came in and did not declare sums of over $10k he referred to US currency. I find it ridiculous that you have to declare more than 10,000 EC dollars, like really? That’s just about US $3,680.00. What the hell?stuuuupes. And still saying after you declare it, if the police are satisfied after asking you questions then you will be allowed to leave?? Like really? Most of the Custom Officers and Policemen are so bias with their job because they will never ask their friends and family any questions let alone search them thoroughly but when it comes to other people, especially the ones they don’t like, they treat them like animals.